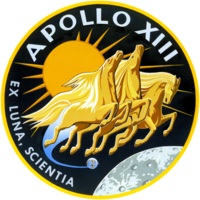 English: Apollo 13 was the third manned mission by NASA that was intended to land on the moon, but a mid-mission technical malfunction forced the lunar landing to be aborted. The launch occurred on April 11, 1970. "Houston we've had a problem here"